The Spanish Civil War Memory Project, an initiative of the University of California at San Diego in collaboration with several Spanish civic associations, seeks to build a digital Archive of the Spanish Civil War and the Francoist repression. Since the summer of 2007 several teams of graduate students have been recording audiovisual testimonies of militants, witnesses, and victims of the war and the Francoist dictatorship. It is a great honor and a pleasure to introduce The Spanish Civil War Memory Project to the ALBA community. Our interactions with survivors of the Spanish Civil War and the Francoist dictatorship follow the principles of solidarity and internationalism as represented by the Abraham Lincoln Brigade. From the inception of this project, moreover, The Good Fight, the remarkable documentary on the Abraham Lincoln Brigade by Noel Buckner, Sam Sills, and Mary Dore, has been an invaluable source of inspiration and a moral compass. 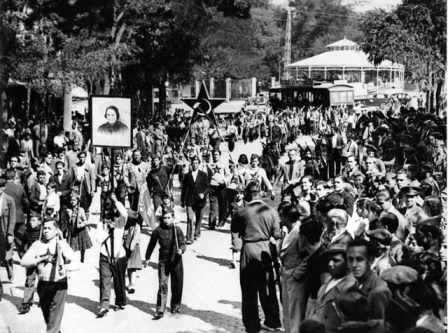 How did The Spanish Civil War Memory Project come into being? The University of California, San Diego (UCSD) is home of the Southworth Collection, the world’s largest archive of pamphlets, memorabilia, and documents from the Spanish Civil War. The collection originally belonged to American journalist, writer, historian, and champion of the Spanish Republic, Herbert Southworth. In the 1970s another illustrious historian, Gabriel Jackson, convinced Southworth to donate his unmatched collection of documents, posters, books, and pamphlets to the Special Collection Library of UCSD. From that moment on the collection has not stopped growing and its funds have continued to expand under the vigilant eye of our librarian and curator, Lynda Claassen. It was precisely in the Fall of 2005, when I met Lynda Claassen, that the idea of the project first came into being. As we brainstormed possible ideas to raise awareness of the collection in Spain, it occurred to us that we needed to connect the Southworth Collection with the already robust social movement for the recuperation of historical memory in Spain. And this is how I traveled to Madrid with Scott Boehm, the first graduate student who participated in the project. Lynda Claassen generously provided him with financial support. In Madrid we met Emilio Silva, the President of the Association for the Recuperation of Historical Memory (ARMH), during an unforgettable session of the film series Images against Amnesia (http://www.imagenescontraelolvido.com/e-index.html). Emilio Silva is the grandson of a Republican leader who was executed together with twelve other men at the beginning of the war in Prianza del Bierzo (León). As many other grandchildren of survivors of the war, Silva knew that his grandfather was executed, but he did not know how, and most importantly, he did not know where his remains were. In 2000, with the help of forensic archeologists and local volunteers, Silva located a mass grave with the remains of his grandfather and the twelve other men. 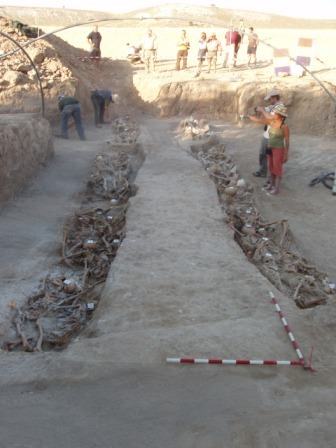 The discovery and ensuing exhumation of “the thirteen of Prianza”, as they are now popularly known, created a media frenzy and paved the way for the emergence of hundreds of civic associations all over Spain. These associations have worked tirelessly to recuperate the dignity of those who fought against fascism in Spain. 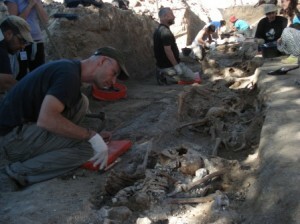 They have excavated thousands of bodies that remained in mass graves, mostly without any State support. And they have mobilized both at a local and national level to destroy the veil of silence and impunity that still prevails in Spanish society. During our first conversation with Emilio Silva we proposed to create an audiovisual archive with testimonies of survivors and antifascist militants. Emilio received the idea enthusiastically and, in fact, shared with us that a similar project had been proposed at the Universidad Complutense in Madrid—although this particular project was, in fact, voted down at the last minute due to political pressures. So one could say we intervened as the Spanish institutions failed to fulfill their obligations toward civil society. Create a safe institutional space in order to validate the experiences of those who survived the violence implemented by the Fascist forces during the Spanish Civil War and the subsequent dictatorship. Create and preserve an oral record of significant events pertaining to the Spanish Civil War and the Francoist repression. The oral stories of these victims are an alternative mode of historical knowledge. As such, the testimonies of these men and women present a different version of the past, one that is extremely important, because, as pointed out before, the majority of the written records of the dictatorship were physically destroyed during the transition to democracy. Record and preserve the audiovisual dimension of these historical testimonies. The audiovisual component of the archive is essential, because it shows the non-verbal dimension of a traumatic testimony. By filming the testimonies we have access to body language, silences, pauses, and other non-verbal elements. These elements provide important information about the affective dimension of the testimony. Furthermore, the images of the testimony show the process of memory in the making, as an open process rather than as a closed product. Make the stories of the survivors of the Spanish Civil War and Francoist repression available on the Internet. This will be an invaluable tool to educate future generations about the traumatic events that took place in Spain during this historical period. In this sense, the archive attempts to recover and to disseminate the multiple political legacies of the men and women who defended our first democracy and opposed the Francoist dictatorship. The same year we also created a video to promote the project at UCSD and in the United States. Although the video was created before the passing of the so-called Law of Historical Memory (2007) and the juridical process opened by Baltasar Garzón and the ensuing decision of the Superior Court (2009-2010) to suspend him, it still captures the nature and the context of our intervention. This video titled “History Project” and other videos can be seen in the web page of the project. Although there are projects similar to this one in Spain, such as the oral history project of the Memorial Democratic de Catalunya or the Sociedad Aranzadi in the Basque country, The Spanish Civil War Memory Project is different from both in its scope and in its methodology. Our methodology combines psychoanalytical theory, Marxism, oral history, and subaltern studies and it is the result of our own findings conducting interviews in the field. This enumeration of theories may sound very abstract, but what really sets apart The Spanish Civil War Memory Project from other interviews and archives, is the fact that our aim is to empower the witness, the militant, and the survivor to tell her/his story in her/his own terms. While most journalist and social scientists enter the interview with a set of predetermined questions and research goals, we approach the interview as an open-ended process that is negotiated during the interview. Rather than deciding before or after the interview what parts are most important or more relevant from a socio-historical perspective, or from any other perspective, we left that to the interviewees and the viewers. For this reason, some of our interviews may last 20 minutes and others may last up to 10 hours. The entire uncut footage of the interviews will be digitized and posted in the website of the archive for everybody to access, for editing is also a way of discriminating among different modes of knowing. For a more complete description of the methodology that we used in the interviews follow this link. Although we were not fully conscious of the implications when we created the protocol, our way of approaching the interviews changed an implicit and fundamental assumption of research institutions. Typically, institutions of higher education decide what is important and how to produce knowledge about subaltern subjects and disempowered communities. In our case, instead of deciding beforehand what the institution wanted to know about survivors of the Fascist repression in Spain, we attempted to empower the survivors so that they could decide for themselves what they wanted to say and how they wanted to say it. In fact, if there is a lesson to be learned from these four years of collecting oral histories in Spain is that we – researchers, students, and faculty—should think more often about how to serve our communities and how to mobilize the resources of the university to help disempowered communities, rather than just thinking about our own intellectual production for the university. In this regard, I can proudly say that neither the students nor myself obtained anything concrete for our academic careers in exchange for our participation in the project. 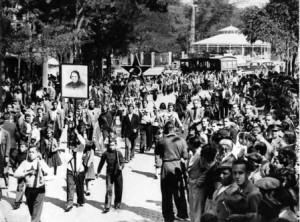 In the best tradition of the Abraham Lincoln Brigade, we all understood that the most important part of our work was to make a small contribution to the struggle against impunity and oblivion in contemporary Spain, albeit a much more humble one. We were painfully aware of the fact that some of these people waited for decades to be able to tell their stories. As an old Republican told us in Huelva, “it was about time that you came to ask me, I thought I was going to die without getting all this off my chest”. Gracias a vosotros, nosotros los represaliados por el franquismo, nos sentimos apoyados para seguir desde aquí la lucha por la restauración de la memoria histórica y por la consolidación de los valores democráticos, hoy tan en peligro por el avance de los descendientes de los que se levantaron en armas contra el gobierno legítimamente elegido por el pueblo. Thanks to you, we, those who were repressed by the Francoist forces, feel supported to continue from here the struggle for the recuperation of historical memory and for the consolidation of democratic values. These values are today again in danger due to the growing power of the descendants of those who rose in arms against the democratically elected government of the people. As an educator this was a very powerful and enlightening pedagogical lesson. We should recognize that these testimonies are not only tools to teach the history of the Spanish Civil War and the Francoist dictatorship, but rather a body of knowledge in its own right. 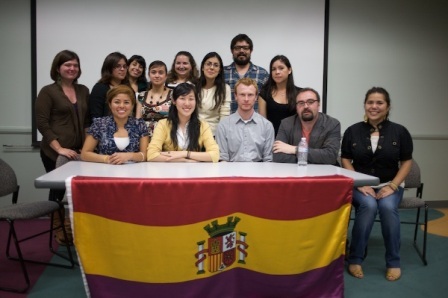 Therefore, we should recognize that no amount of books or films can substitute for these testimonies, for as Cristina González put it in the aforementioned presentation of UCSD undergraduates, “books don’t cry and don’t translate the courage to struggle for social justice in the most adverse circumstances”. Yet, in spite of inspiring this important dialogue across borders and generations the project was from the beginning under funded. The Division of Arts and Humanities of UCSD generously funded most of our teams, but they also made it clear from he beginning that the money was a temporary bridge to secure a private donation or the sponsorship of a private foundation. In spite of all of our efforts we were not able to secure these private funds and the project came to a halt last summer. To be sure, the financial crisis of 2008 did not help us, but there is also here a cautionary tale about the risks of a fully privatized university. After all, what private donor will finance an archive with testimonies of communists, anarchists, and other revolutionaries? Many supporters of the project, however, expressed disbelief when we told them about our financial problems. How could it be –they asked—that in the age of human rights causes this project does not receive any funding? But that is precisely one of the problems. I understood after a presentation we did at the Joan B. Kroc Center for Peace and Justice at the University of San Diego, that the US Western conception of human rights is completely at odds with a project such as The Spanish Civil War Memory Project. These generously funded institutes and foundations are in search of abstract victims, wounded subjects that can legitimize a political calculation in order to promote forgiveness, reconciliation, and liberal democracy. Yet the people we interviewed will never accept such a framework, for they refuse to speak as victims or to accept that their experiences will be reduced to a tool to promote liberal democracy and free market. To be sure, they fought for democracy, justice, and freedom, but not in the narrowed minded version promoted by the US and other western democracies. I am sure that the members of the Lincoln Brigade that we also wanted to interview are very familiar with this monolithic US based notion of democracy, because many of them were ostracized during the Cold War simply for having fought in defense of the Spanish Republic and against European fascism. Hence, one of the political values of the project resides precisely in exposing other ways of thinking about democracy as a social movement and as an ongoing revolutionary ideal. We may not get funding for this project, but we will not be silenced and forgotten; we will continue to fight for a better future in the best tradition of the Abraham Lincoln Brigade. Luis Martín Cabrera is an Assistant Professor at the University of California, San Diego. My father and his brother were German-Jewish refugees, who were forced to flee Germany in May, 1933. When the Spanish Civil War started, they were in Paris. Like other young men whom they knew, they decided to volunteer to fight against Franco. They enlisted with POUM in September, 1936, and they were headquartered in Barcelona. My dad was officially a machine gunner, but he actually was an iarplane mechanic who worked on a few obsolete German planes at an airfield in or near Barcelona. My uncle was a foot soldier. Both my dad and my uncle were wounded in the fall of 1936, most likely in or near Sietamo. In the 1990’s before both men died, I interviewed them and recorded their life stories. Would you be interested? I also have some photos and documents they gave me.